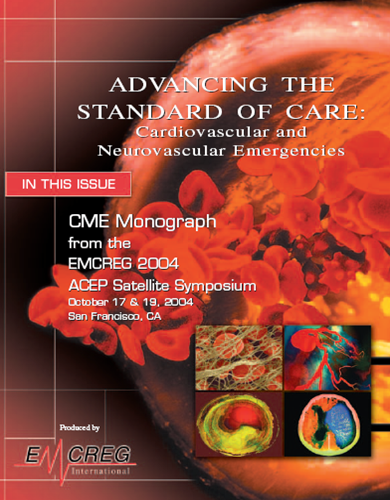 EMCREG-International is pleased to present this educational monograph summarizing our 2004 ACEP Satellite Symposium on cardiovascular and neurovascular emergency care held in San Francisco. Topics presented included: Point-of-Care Testing for ACS in the ED; STEMI Time-to-Treatment; Chest Pain Center; Heart Sound Recording; Anti-Platelet and Anti-Thrombotics in ACS; BNP Consensus Panel; Stroke, and Intracerebral Hemorrhage. It is our hope that this material will provide emergency physicians with information necessary to help care for these seriously ill patients.